Alas, the saga of “Sayward The Bad Blogger” continues. Do you celebrate the Winter Solstice? I do. In fact, it’s one of my very favorite holidays. And last week, I threw my first ever Winter Solstice bash. It was my first, because up until now, I’ve been celebrating with my godparents every year. For decades (and you can see last year’s celebration here) my godparents had been hosting an annual Solstice celebration. But circumstances change, and times change, and this year my godparents didn’t have their party. So I took the ball and ran with it. And I strung up faerie lights all through my trees, and set out a vegan cheese platter with olives and crackers, and cookies and a well-stocked bar. I invited all my friends, old friends and new friends and all their children too. Jeremy built a bonfire in our “new” antique fire pit, and all the grown ups were merry and drank wine while the children ran wild like little witchy wonderthings. And I gathered everyone around the fire, and thanked them for being there. And told them the story of “the goose poem” (grooooan), and then I read it to them (you can read that story, and that poem, in last year’s Solstice post). And I even did all of that without crying . . . mostly. What a sap. Oh, and I didn’t take one single photo all night. BAD BLOGGER. It was such an amazing party, just awesome and oh! I really wanted to share it with you! But oof, such a bad blogger. *sigh* Next year I’ll take photos for sure. But Christmas! 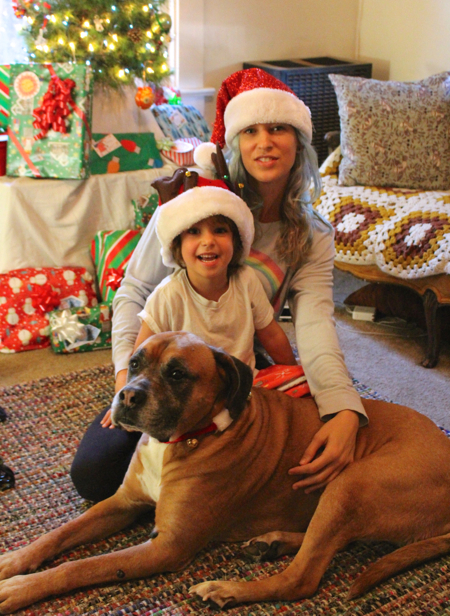 I did take pictures on Christmas, which was so fun with the sweetest little 4-year-old in the whole wide world. 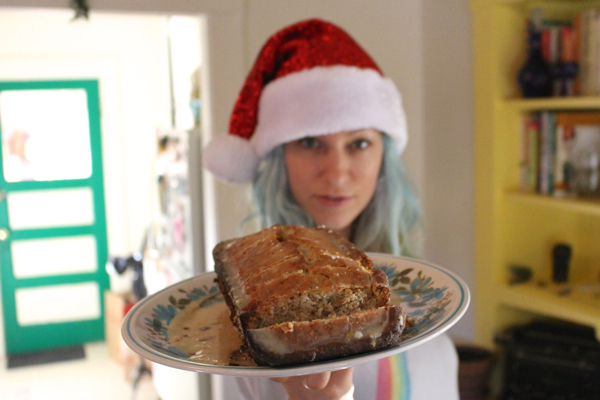 On Christmas Eve, Waits and I baked a gluten-free vegan lemon loaf, which seems to be a tradition for us. 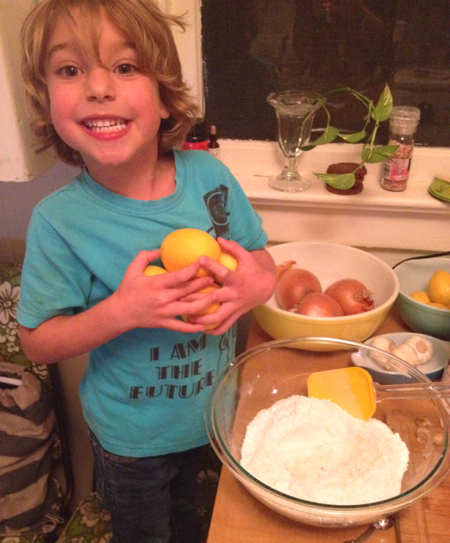 We used Meyer lemons right off our tree – our first lemons of the year! From the tree that I bought way back in Portland, before Waits was even born, and that over-wintered in a pot in our living room there. Now it lives outside year-round . . . I guess it likes southern California as much as I do. 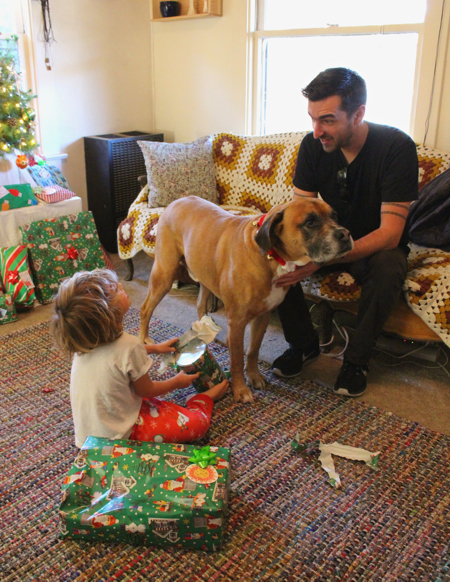 First thing Christmas morning, Waits went for his stocking (mostly full of new socks, and vegan candy – thank you for making that easy Vegan Cuts! ), and I texted Damian to hurry on over. The kid was ready for presents! 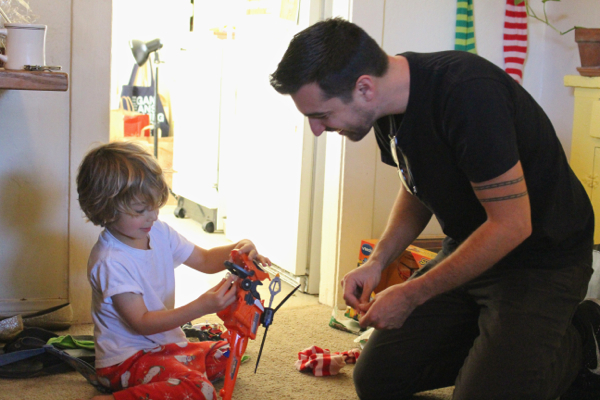 For the second year in a row, I got to spend Christmas morning with my son, and his daddy, and my partner. All together. And I realize how rare that is, and truly what a treasure I have in this strange little mixed modern family. I am grateful to Jeremy and Damian both, for being so open-hearted. Waits and I sure are lucky! 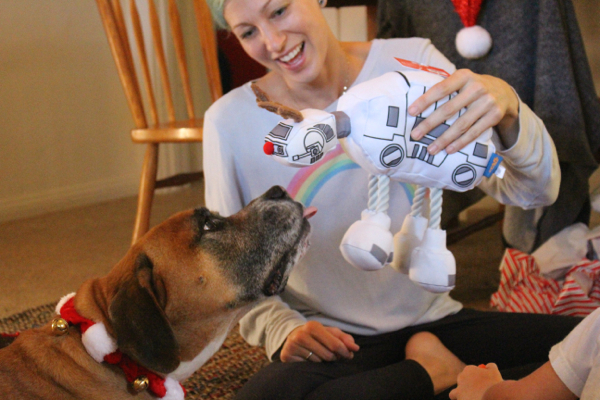 The old man sort of got spoiled this year (well deserved), but this ATAT chew toy was by far his fave. 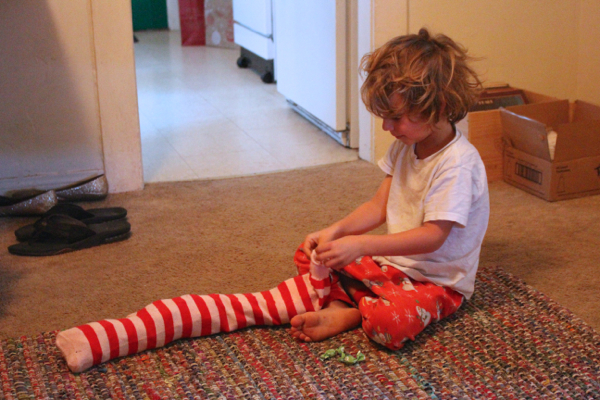 He immediately began working on it, and spent the next half hour or so tearing off the Rudolph nose. He then proceeded to pass out in an ATAT-Harley heap, ostensibly from the sheer exhaustion of it all. It was, in fact, adorable. 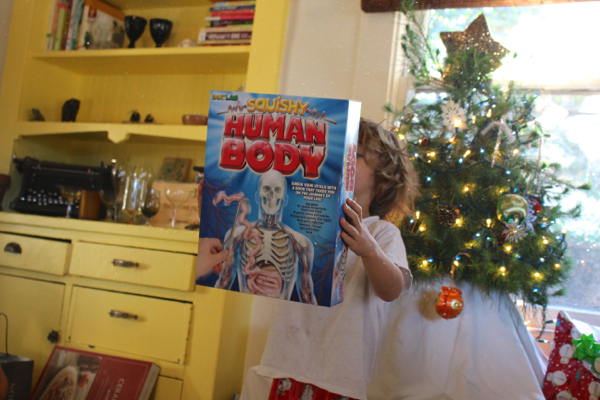 And Waits’s pièce de résistance, his human body model kit with a real! squishy! brain! Once everything was unwrapped it was play time, and putting together that model body was first on the agenda. He was so excited! Around noon, Waits and Damian had to leave, to catch a flight up to Seattle to visit Damian’s parents. And so Jeremy and I were left alone . . . on an afternoon, with nothing to do . . . for the first time in months. No really, it was LITERALLY Jeremy’s first day off in more than 60 days. 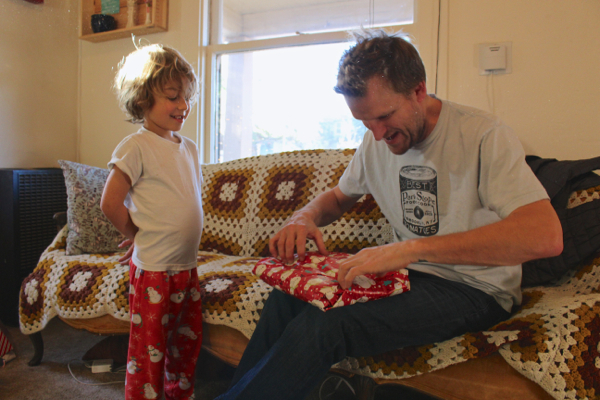 So we went to his house, and exchanged our gifts (nothing much, this year) and put on A Christmas Story. And then we passed out. Ha! We slept for hoooooours, and it was glorious! In the late afternoon/early evening we decided we should probably stop being lumps and venture out. 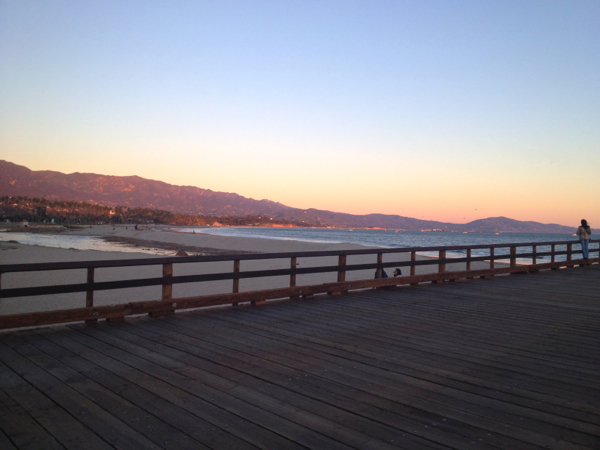 And it was perfect timing for a sunset beach walk. 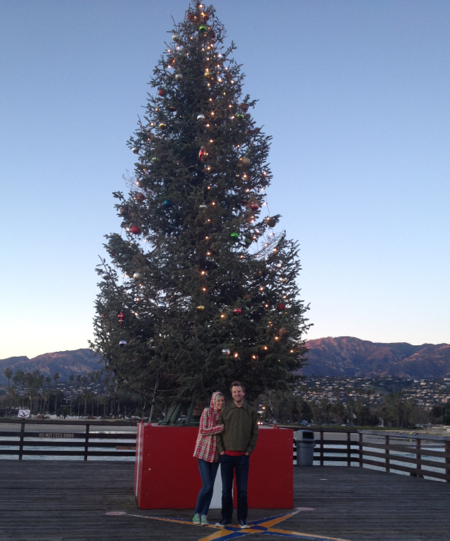 And the big Christmas tree at the very end of it. From there it was back home (it was cold outside!) for a long evening spent cooking together – something we used to do all the time but almost never get to do anymore. I was a little blue, and really missing Waits, but it sure was nice to be able to spend some relaxing time with my love. 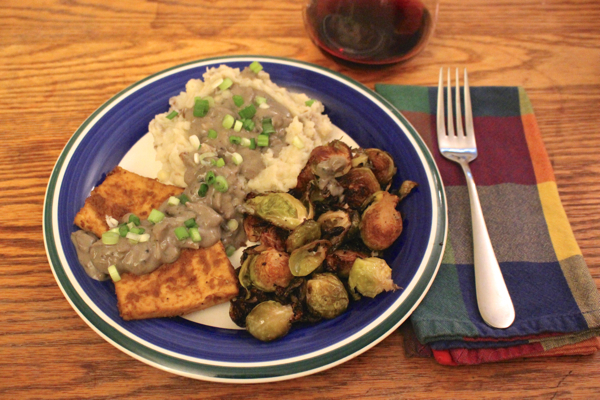 Served with an ’04 Brunello di Montalcino, and damn that was a good meal. 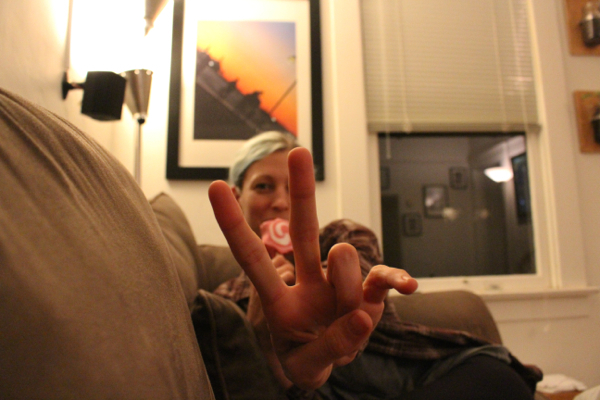 After dinner was more cuddling, a rousing round of Gin Rummy, and late night peppermint ice cream pops. 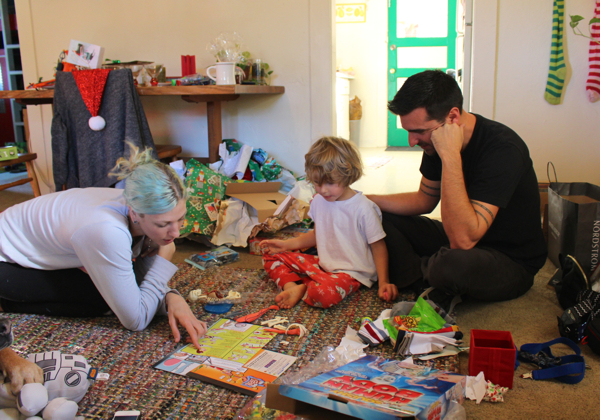 All around, a near-perfect Christmas, I’d say. I hope your Christmas day was a wonderful one as well, whether you were celebrating the holiday, or whether it was just another Thursday in December. Peace! My wish for all of you, now and in the new year. Thanks for sharing your christmas and solistice experience with us (don’t worry about not taking pictures of the solistice celebration). It looks so comfy and peaceful! 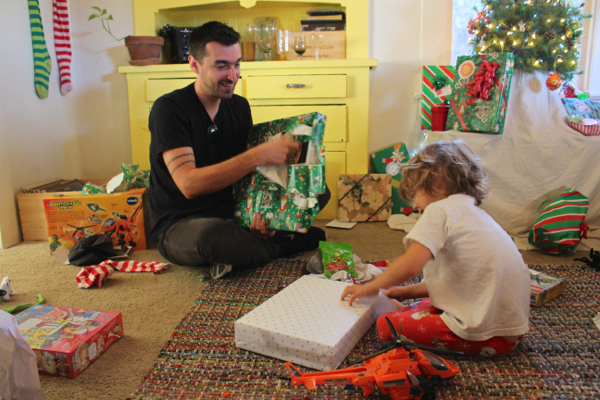 I totally love that Damian and Jeremy are both a part of your christmas celebration. Great guys, great modern family :-) And so inspiring! Have a fantastic new Year! any chance you could post the lemon loaf recipe?!?! Thank you Meredith! And thank you for being understanding. Happy Holidays! Thanks Sonja, and Happy New Year to you, too! Preheat oven to 350. In a bowl, mix gluten-free flour blend, oat flour, evaporated cane juice, chia seeds, baking powder, and salt. Stir well to combine. Add the plant milk, melted coconut oil, vanilla, lemon juice, and lemon zest. Mix all ingredients together until smooth. Pour the batter into a greased (with coconut oil) loaf pan, and bake for 60-70 minutes, or until a knife comes out clean. Yes PLEASE share the gravy recipe. 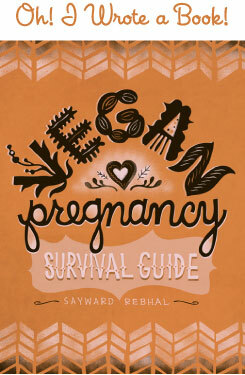 I’ve had a hard time finding one that works and is GF and vegan. Thanks! You are such a wonderful person – and you seem like the perfect mother to Waits! Your blog is an inspiration to me, and it always offers some joyful reading time. Glad to see you all had a nice solstice celebration and a peaceful Christmas!